Split Rock Golf Course is one of the best-kept secrets in the Northeast, offering 27-holes to resort guests and the public. It's majestic 585-yard 11th hole claims one of the most spectacular views in the entire Northeast, let alone one found on a golf course. Because the holes are spaciously distributed, carts with GPS are provided. Play takes about 4 1/2 hours to complete 18 holes. The starting tees on this 6,500-yard course are impressively landscaped. Offering championship black to ladies red, each starting tees offers its own unique view of the fairway, having been positioned at different angles and elevations. The trees surrounding the course are abundant and as most trees indigenous to the region, positively burst with color in the fall. On some holes the trees create tight fairways, but the grounds crew at Split Rock do an excellent job managing the undergrowth so a duffer can find their ball without considerable difficulty. 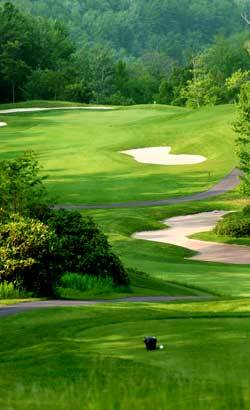 Split Rock Resort is a thinking man's course and has to be played with a combination of strategy and power. The driver will see use on the longer holes three holes are over 550-yards and other holes where only a thunderous drive can clear water to reach the fairway. Ravines, ponds, and bunker-lined fairways, along with the occasional deer or turkey, require the golfer to carefully measure their club choice. 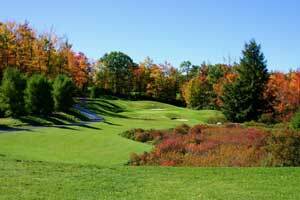 The Split Rock Resort is widely known outside the Pocono community, at 90 minutes from New York City, it should be included in any tour of courses to play in the Northeast.